In the early 1800s, the area where City Hall now stands overlooked the junction of the Oswego and Erie canals. This bustling intersection of waterways became the site of the Weighlock Building, now home of the Erie Canal Museum, and a Market Hall, for which Market Street, on the east side of City Hall, was named. The old Market Hall, circa 1889. Photo courtesy of the Onondaga Historical Association. Syracuse, called the “Salt City,” flourished in the mid-1800s. Although the city had lost its 70-year monopoly in salt manufacturing the economy continued to prosper thanks to diversified industry, the Erie Canal, and the railroads. In 1848, Syracuse was incorporated as a city, and, in 1852, after its ground level market stalls were converted into municipal offices, Market Hall became known as “City Hall.” The upper floors consisted of additional offices, as well as a busy public hall. The square in front, originally intended as an outdoor farmers’ market, became a park with large elm trees and a cast iron fence. In 1857, a bell tower was added to the front of City Hall, and, in 1858, a bell was installed. The bell became an important feature in city life; it rang on many public occasions, particularly to warn citizens of fires. In those days of volunteer fire fighting, a dollar reward was paid to the first person to spot a fire and ring the bell – a custom sometimes abused. 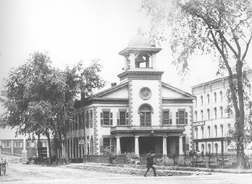 By the end of the Civil War, Syracuse had firmly established itself as the cultural and commercial center of New York, and the old Market Hall had become inadequate. A new City Hall – originally proposed during the tenure of the first mayor, Harvey Baldwin – was deemed essential; and, in 1889, Mayor Will B. Kirk appointed a commission to oversee the project. A newspaper editorial urged that the proposed building be “functional and handsome without being showy,” pointing to Albany’s City Hall, designed by Henry Hobson Richardson, as the “most beautiful municipal building in America.” Richardson, a well-known American architect, had died in 1886. His designs, inspired by medieval Romanesque architecture, came to be known as Richardson Romanesque, a style often employed for city halls during the 1880s and 1890s. Eight local architects submitted plans; those of native Syracusan Charles E. Colton were chosen. The construction contract was awarded to Hughes Brothers of Syracuse and all contracts for interior work also went to local firms. Unfortunately, a committee appointed to select important documents to deposit in a cornerstone could not reach a decision, and so the cornerstone was not filled. To compensate for this omission, the City Hall Centennial Celebration in September, 1989, included the burying of a time capsule containing artifacts from 1989. But a controversy arose over the bell tower that allegedly cost both Mayor Kirk and Charles Colton their jobs. Colton did not want the tower spoiled by the mechanical equipment that the bell required. Others felt strongly that the 5,000 pound original bronze bell rightfully belonged in the tower. Colton was replaced before construction was completed, and the tower issue is believed to have contributed to Mayor Kirk’s defeat by William Cowie in 1891. The bell did go into the tower, but was eventually removed and melted down for use by allied troops in World War II. Thereafter, the tower remained silent until 1987, when the Rotary Club donated electronic carillons and a bronze plated aluminum bell. In 2010, a new Rotary donation updated the carillon to a digital system. City Hall was originally built with the main entrance at the back, facing the Erie Canal. The police department occupied this rear portion of the building, which contained prisoners’ cells, offices, a court room, and even an armory where rifles and ammunition could be stored “in case of emergency.” In 1905, the Water Street entrance was closed and the space converted into municipal offices. A bronze tablet to the west of the main entrance on Washington Street bears construction dates, names of commissioners, architect, and builder. Another bronze plaque to the east represents the original city seal. A bronze plaque containing a rail section, embedded in the sidewalk in front of City Hall, commemorates the removal of trains from the city’s center in 1937. The old seal reappears in the stained glass panel above the double-leafed entrance door of carved oak. In 1988, stained glass panels featuring the new Syracuse logo were donated by Nine Brothers Glass Company of Syracuse. All woodwork in the interior of City Hall is oak. Ornamental scroll work and newelposts of cast iron embellish the staircase. Since construction costs were lower than the appropriated sum of $30,000, various improvements were made, including the installation of two elevators and the substitution of marble and tile wainscot for oak in the entrance hall and other prominent areas. The colorful tiles covering the entrance floor are originals to the building. The original Mayor’s three-room suite, located on the main floor, was equipped with a fireplace of onyx tile and a carved oak mantle. The Common Council Chamber on the third floor, a large assembly hall two stories high and seating 1,200 people, featured a skylight and stained glass windows. The prevailing color was a soft yellow, and a frieze of festooned lilies ornament the walls. In 1919, the room was subdivided into two floors, thus providing space for the city engineers’ office on the fourth floor and mechanical equipment on the fifth floor. City Hall has undergone relatively few changes over the years. Flower beds that once flanked the entrance were replaced by parking spaces. In 1977, a major renovation project was undertaken by local architects Quinlivan, Pierik & Krause. An important component was the restoration of the Common Council Chamber to its original dimensions. In 1976, the building was listed on the National Register of Historic Places. 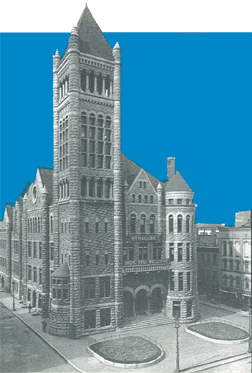 In September, 1989, the centennial of City Hall was observed with a day-long celebration, which also included the opening of a permanent exhibit in the main hallway of historic photos depicting downtown Syracuse, the Erie Canal and City Hall. 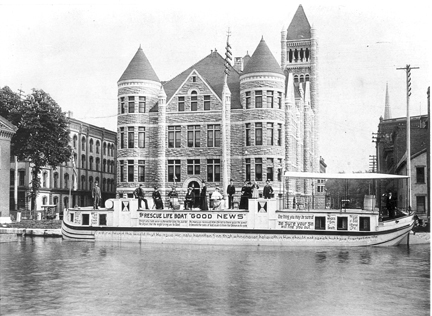 The Rescue Mission Lifeboat in the Erie Canal Basin behind City Hall, circa 1895. Original text prepared by Evamarie Hardin.